K.I.S.S. 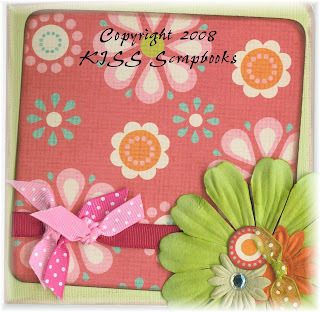 Crop-n-Shop Scrapbook Events: Do you ever? Get in a rut? I've been in one lately, I can't seem to get in the mood to do a page layout for the life of me! Now board books and acrylic albums, I'm on a bit of a roll!! Funny how that goes huh? Here's the newest board book, I called it Girly Girl simply because it's all those fun, bright colors that just shout "girly girl". This is a fun 5 x 5 board book kit filled to the brim with newMy Mind's Eye papers, tons of fun ribbon and embellishments. What's crazy is that everything, all papers are cut for you. The only thing you have to cut is the ribbons. I've even rounded every corner for you! Crazy, I know but there's more. I've even stacked the pages in the order that you will use them and included colored instructions!! 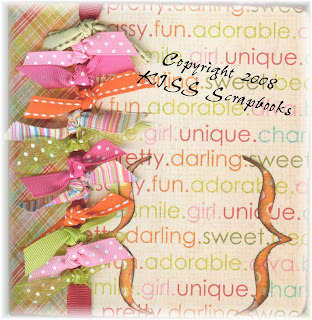 If you like this fun little girly book as much as I do head over to http://www.licketysplitscrapbooks.com and click on the What's New button. Wendy's selling them in the store and at all Creating Keepsakes shows. I'm working on the boy version tonight, hoping to finish it up tomorrow. I'll post pictures of it when it's finished. What do you do when you are in a rut? Do you have places you go to seek inspiration? Great websites? Magazines? Catalogs? Do you just walk away until something strikes you again? I'd love to hear what inspires you to create, is it your pictures? Paper? Ribbon? I'd have to say I will often times find a yummy ribbon and that will spark an entire page/book. I know, weird? I just LOVE ribbon, as you can tell from the book above!! LOL!! I better get back to work on the boy version of this book, have a great Monday! !